A perfect one pot dish to share, full of flavour and relatively simple to prepare. You could also add some prawns and mussels for more a more traditional dish. Heat 1 tbsp olive oil in a large pan, add the chicken and cook over a medium heat for 4 – 5 minutes until browned all over. Add the chorizo, paprika, cumin, salt and pepper and cook for a further 2 – 3 minutes. Mix in the garlic, onions, tomato stirring constantly until cooked. Remove and set aside. In the same pan, heat 1 tbsp olive oil and sauté until the rice until translucent. Pour the chicken broth over the rice and cook for around 25 minutes until the liquid has been absorbed. 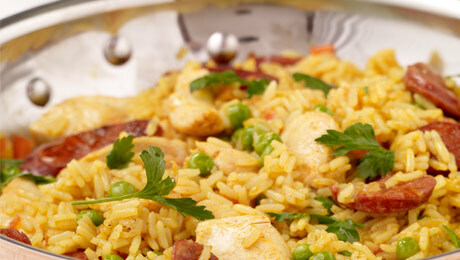 Add the peas and cook for a further 5 minutes, return the chicken and chorizo mixture to the pan, serve immediately. This is a great recipe which I have made so many times. Thought it was simple and clear and the result is delicious. Lovely hot or cold. This was really tasty and went down well with everyone. My mum made it the day before me but had no paprika and used hot chili powder instead, she said it gave it a nice little kick, I had only sweet paprika and found it could have done with some chili, just need to experiment by tasting in future for flavourings but such a great tasty one pot dish. Will be making it again very soon especially with this cold miserable weather we are having.